Who would have thought marrying the tall ride height and all-wheel-drive ability of an SUV with the fastback styling of a sleek coupe would produce a desirable vehicle, but that's exactly what BMW has done with the 2017 X6 SUV. Although not the most versatile vehicle, the X6 is a good match to the Mercedes-Benz GLE and Infiniti QX30. If you're looking for a luxury SUV with unique looks, good handling and a lengthy options list, the 2017 BMW X6 SUV might appeal to you. It doesn't come cheap, but then again what BMW does? If you need any part of the "utility" in Sport-Utility Vehicle, the 2017 BMW X6's tiny cargo area, sharply slanted rear hatch and small rear seat probably won't impress you. An X5 gives you similar performance as the X6 within a far more usable package. Changes for BMW's 2017 X6 SUV are minor this year. The navigation system is updated to iDrive 5.0 and the Anthracite headliner is now standard. The 3.5i's Premium package is enhanced with wireless phone charging and a Wi-Fi hotspot. Despite its hulky, oddly proportioned exterior, the 2017 BMW X6 SUV is an impressive performer. The all-wheel-drive grip and 445-horsepower twin-turbocharged V8 in the xDrive50i is particularly alluring, especially in light of its 4.6-second zero-to-60-mph run. The X6's wide tires hold the pavement like Jack and Rose clutching the Titanic's rail just before going under, making it more fun to drive than the larger X5. In town, the X6 behaves very much like a BMW sedan, which is to say comfortable and responsive. Off-roading is not recommended, but thanks to its all-wheel drive and hill-descent control, the X6 can tackle steep terrain providing its limited ground clearance doesn't become an impediment. The X6's rear quarters suffer from massive blind spots making backing up or maneuvering somewhat laborious, and we were unimpressed by the less-than-seamless idle start/stop system. Thankfully, the engine-idle feature can be disabled. The least you can pay for a 2017 BMW X6, including the $995 destination charge, is the Manufacturer's Suggested Retail Price (MSRP) of $62,395 for a base-level X6 sDrive35i. In other words, you're paying about $6,000 more than a base X5. Add about $2,500 for all-wheel drive. If you want the V8-powered xDrive50i you're looking at nearly $77,000. And for the ultimate in ridiculous power in your SUV, the 2017 BMW X6 M starts at around $103,000. That's Porsche Cayenne money no matter how you slice it, and the Mercedes-Benz GLE Coupe is in the same neighborhood. 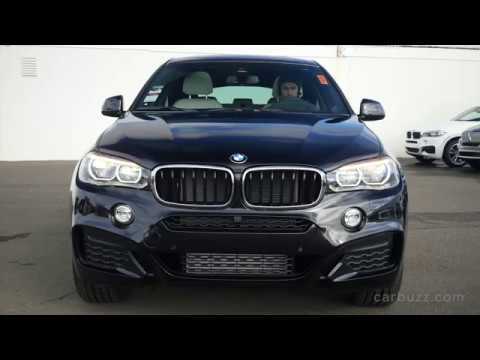 Before buying, be sure to check the KBB.com Fair Purchase Price to see what others are paying for their X6. If past performance is any indicator, the X6's resale value is expected to be in line with Infiniti's coupe-like SUV rival and lower than that of the Porsche. In comparison to the X6's other interior features, the 10.2-inch high-resolution display screen looks like a 72-inch flat-screen TV in a studio apartment. Not that we mind as the display provides crystal-clear navigation guidance, entertainment info and readouts. The complex nature of today's cars makes timely maintenance all the more important. With BMW's Ultimate Service, factory-scheduled maintenance is covered for four years or 50,000 miles, saving you money while giving added peace of mind. The service also includes four years and unlimited miles of roadside assistance. There are three different turbocharged engines to choose from in BMW's 2017 X6. First is the 6-cylinder available in the RWD sDrive35i and AWD xDrive35i. The xDrive50i uses a twin-turbocharged V8, and the X6 M uses a higher-output version of that engine for ultimate go power. All models use an excellent 8-speed automatic transmission, and all also feature an auto stop/start function that stops the engine in situations such as traffic lights where it would otherwise idle. The startups can be jarring and, if frequent, annoying. Thankfully it can be disabled with the touch of a button. Who could have imagined marrying the tall ride height and all-wheel-drive ability of an SUV with the fastback styling of a sleek coupe would produce a desirable vehicle, but that's exactly what BMW has done with the 2017 X6 SUV. Once an army of one, the X6 has been cloned by such notables as the Mercedes-Benz GLE Coupe. Frankly we're somewhat puzzled by the X6's appeal. It isn't a very off-road-capable vehicle and comes up short in areas designated for cargo and passengers. The X6 is, however, remarkably fun to drive and seems to have gained a loyal following. The safety. I love the cameras and the call button in case of an emergency. I love my BMW. The safety features are the best. It does have a good bit of road noise that is not great for a road trip.